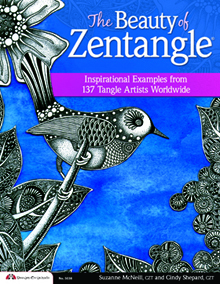 View a YouTube, get a peak inside ‘The Beauty of Zentangle’ as well as other Zentangle® books and learn the basics of the art form. The YouTube I posted this week serves as an introduction to the wonderful world of tangling. 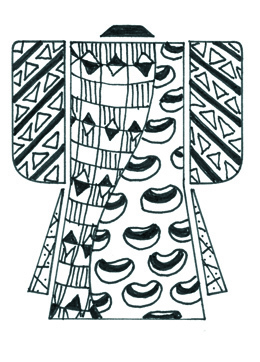 ‘The Beauty of Zentangle’ has been chosen by a European publisher to be translated into German. 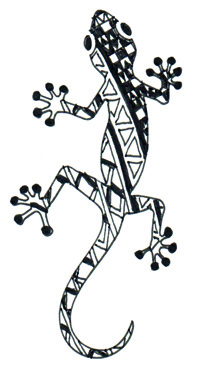 I was asked to do a promotional video for them in order to present the story of Zentangle to a German audience. 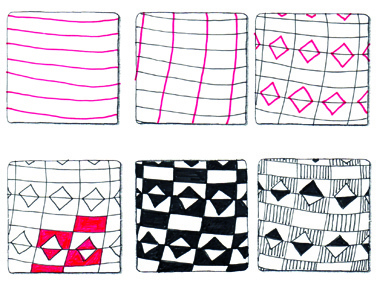 They plan on translating some of the other Zentangle books as well. Of course I can’t speak a bit of German, the book will be translated with ‘voice over’ in German. I can not wait to see me Deutsch Sprechen (speaking German). I was thrilled to work with so many talented artists on ‘The Beauty of Zentangle’. 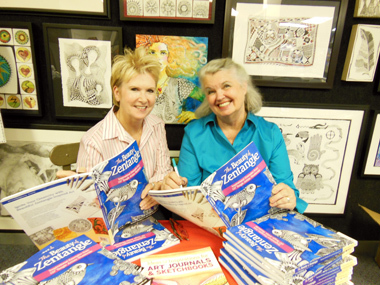 The book really is a wonderful example of what artists from all over the world are accomplishing with Zentangle Inspired Art (ZIA’s). Co-author, Cindy Shepard and I will be hosting a book signing party at Sparks Studio in Arlington, Texas on Saturday, October 26th. 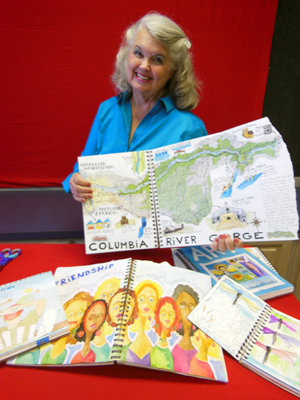 Several other guest tangle artists featured in the book will be on hand to sign their pages as well. Books are available for purchase or bring your own copy – Cindy and I will be happy to sign them. Paula Pillow teaching on an Open Play Day at Sparks Studio. A Play Day party will also be held in conjunction with the book signing. Lots of fun, supplies and teachers to guide you through some great mini-workshops. 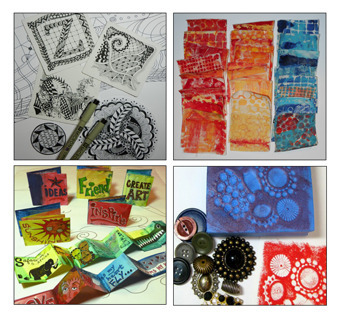 Have you experimented with the Gelli Arts Printing Plates? We will be providing papers and fabrics and show you techniques to use to make your own Gelli Art. Experience making your own memory foam stamps, this unique product allows you to use almost anything as a basis for your stamp designs… we’ll show you how. Make your own tiny Doodle Bug Book too – using watercolors, markers, stamps and images. 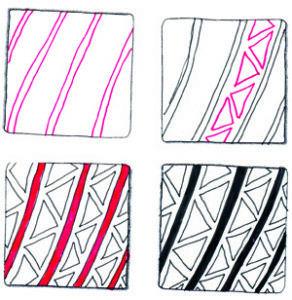 The Play Day would not be complete without a Zentangle project, learn the basics of this amazing art form and new tangles. 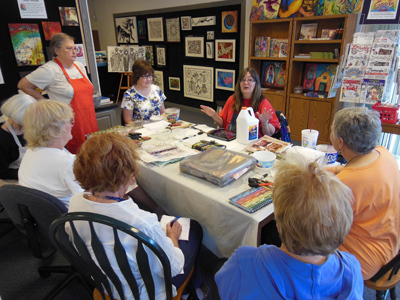 Take home a Micron pen, an official Zentangle tile, Gelli Art fabric and paper, and a memory stamp… all with your art. For more information you can visit the Sparks Studio website. Stop by and bring a friend!! View a YouTube, get some fun and useful tips to help create beautiful and interesting pages in your travel journal. My favorite buzzword in the art world is “intuitive”, I love applying this word to my method of journaling. Intuitive is another word for instinctive. Art is instinctive for so many of us. We may get caught up in what we have learned is the “right way” to draw a horse or use watercolors but when you let yourself make art instinctively you often find your true self and artistic style. You are free to fill your sketchbooks and journals with whatever you are thinking of at that moment or dreaming of for the future. I have kept personal sketch-journals for many years. Recorded in these valuable books are memories of travel, friends, family, events and ideas. In putting together the book ‘Ideas & Inspirations for Art Journals and Sketchbooks’ I get to share my techniques, thought processes and tips that have kept me inspired to journal these many years. Teaching an Intuitive Art Journal class is another way I keep myself inspired to journal, I love seeing the wonderful art created by my students. Student Cara Mozulski was so creative with her journal pages on elephants… I love the butterfly wings for elephant ears! I taught this class at the Guadalupe Rubber Stamp Store and Artisan in Sante Fe, New Mexico this year. TIP: Jot down October 17-19, 2014 on your calender – Artisan Expo will be in Santa Fe again (tons of discounted art supplies, lots of great teachers, and an opportunity to visit Art Mecca for inspiration). I hope to see you there. I will also be teaching ‘Intuitive Art Journals’ at Art and Soul in 2014. Hope to see some of you there, and keep journaling!